"Combat Studies Institute Report No. 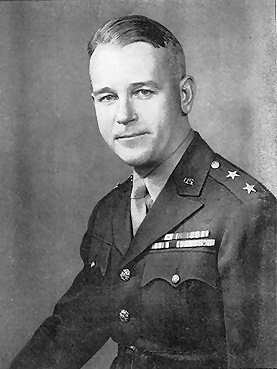 5 - CONVERSATIONS WITH GENERAL J. LAWTON COLLINS"
Why did we keep pushing divisions into the Huertgen Forest in what seemed to be a stalemate in 1944? Well, I complied with the orders of the First Army. It was an area that had to be covered by somebody, and we happened to draw the area: Aachen, and then Malmédy, and then a goodly portion of the Huertgen Forest. I didn't have any choice in it. I would never pick it as the place to be. It was assigned as part of my corps sector, and reluctantly we had to fight in it. At the time when we took over that area, the corps was on a front of thirty-five miles. That's much too big a front for a corps, so what we did was narrow down the active front. We put 3d Armored and the First Regiment of the 9th Infantry Division on a fifteen-mile front and then covered the rest of the corps front with a reinforced cavalry group under a great cavalryman and fine fighter, Joe Tully, West Point, 1916. I gave Joe a little additional artillery, an additional battalion of tanks, and a battalion of infantry. Joe really had a small corps of his own. He did a wonderful job with it. Somebody had to cover the Huertgen Forest. I happened to be the unlucky one this time. But not all of it, because later on, the area was turned over to a different corps, and it did the real fighting in the forest. We fought on the fringe of the forest, most of it. We did finally clear the top end of Huertgen, but it was tough going. Anybody who had to fight there would have had the same problem. Nobody was enthusiastic about fighting there, but what was the alternative? The Germans didn't counterattack against my flank, because we had some troops there that would have prevented them from doing so, but if we would have turned loose of the Huertgen and let the Germans roam there, they could have hit my flank. It's easy to go back to second-guess and say, "Well, you shouldn't have done that." Then what would you have done? Who would have cleared it? How much time would it have taken? Nobody was enthusiastic about it, least of all the 704th, but we had to do it. That was part of our job, but we didn't fight it all. The V Corps later took over. The forest covered a series of dams that our intelligence people had alerted us about. I was going to ask you that, too, sir - Why weren't the Roer River dams selected as an objective? - but you just answered it. The intelligence people didn't see them as an important objective. They didn't, and they didn't recognize the threat they posed. We all knew there were some dams. We had not studied that particular part of the zone. They came as a surprise to most of the intelligence people in the army. There were two or three of them. It was sometime before First Army realized their capacity to flood the southern part of the army zone of action. That was an intelligence failure, a real combat intelligence failure, on the part of the top intelligence people.